A valley fill beneath a mountaintop removal mine in eastern Kentucky. The Stream Protection Rule would have limited the practice. UPDATE: On Feb. 16, President Donald Trump signed a bill to reverse the Stream Protection Rule. Read our press release here. Citizens across the nation are talking about mountaintop removal right now, following the House and Senate votes last week to repeal the Stream Protection Rule. The Senate voted 54-45 on Friday to repeal the rule through a rarely-used law called the Congressional Review Act. Contrary to some claims that the Stream Protection Rule was a last-minute Obama dig at the coal industry, the rule had actually been under development by the Office of Surface Mining Reclamation and Enforcement for most of Obama’s presidency. It would have updated a 34-year-old version of the regulations, known as the Stream Buffer Zone Rule. 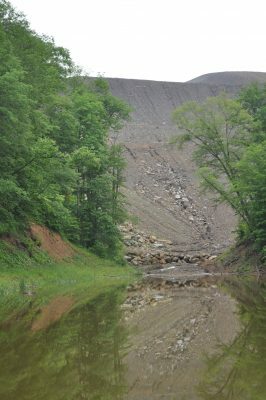 Both rules spell out implementation details of the 1977 Surface Mining Reclamation and Control Act, which remains in effect even without the Stream Protection Rule. Headlines widely shared over social media alerted the nation to the end of a rule that would have “stopped” coal companies from dumping waste in streams. In the comments, people braced themselves for the coming impacts. But what many do not realize is that coal companies have been dumping their waste into streams in Central Appalachia for decades, and continue to do so now. They did it under President Bush. They did it under President Obama. The practice is called “valley filling” and is a byproduct of mountaintop removal coal mining in Central Appalachia. The new rule would have limited this practice, but it would not have ended it. Threats to public water from corporate and political interests are nothing new in Central Appalachia, nor is the problem unique to this area. The chemical spill in Charleston, W.Va., coal ash contamination across North Carolina, lead contamination in Flint, Mich., and the fight against the Dakota Access Pipeline in Standing Rock Reservation have shown us that. Despite intense polarization in the United States, polling shows that a majority of Americans are concerned about threats to clean drinking water. Communities that already have contaminated water are imploring their leaders to do something about it. Meanwhile, politicians in Appalachia and elsewhere ignore this public demand and continue to act in favor of corporate interests. Mountaintop removal production in Central Appalachia has declined by about 70 percent since its peak in 2008. Coal is being outcompeted by natural gas and renewables, and the easily accessible coal in Central Appalachia is running out. Appalachian people know this. They know that now is the time to diversify the economy and protect critical resources like clean water. Despite the decline, mountaintop removal is still happening. New permits are still being issued and citizens living downstream are still suffering the consequences. The Stream Protection Rule was not going to end mountaintop removal, but it would have improved clean water protections. The communities of Flint, of Standing Rock and of the Central Appalachian coalfields are glad for the attention they are receiving right now because it strengthens their fight. But what they really need is continued support for a long fight. Indigenous people, communities of color, Appalachian Americans, and poor and working class people across the country have always had to fight for basic rights like clean water. This fight will continue. Not because it is easy, but because it is necessary. Donate to help us fight for Appalachian streams and communities.